In a previous article, Disclosures, we discussed the disclosures required by ASC 606. Now that most public companies have filed their first 10-Qs under the new standard and some have filed10-Ks, we can provide examples of these disclosures. In this article we focus specifically on disaggregation of revenue as disclosed by Ford Motor Company. We looked to paragraph 606-10-55-91 and considered the example categories of type of good or service, type of customer, and timing of transfer of goods or services to be relevant to the disaggregation of our contracts. Geographical location, type of contracts, contract duration, and sales channels were not materially relevant disaggregation criteria for our contracts. Finally, we also considered customer class and significant performance obligations to be significant differentiators of our types of revenue contracts. Was the customer a dealer or a retail customer? Was the amount received fixed or varied? Did the contract involve significant ongoing performance obligations? All vehicles, parts, and accessories are sold to the same type of customer: Ford’s dealers. Ford recognizes revenue from these three products when they are shipped, and requires payment within 30 days. Based on the company’s response, it appears that Ford viewed the existing potential categories, especially the class of customer, timing of payment, and contract similarities, as more heavily weighted than right of return. Therefore, despite differences in the right of return option for parts vs. the right of return option for vehicles, Ford grouped parts and accessories together with vehicles. 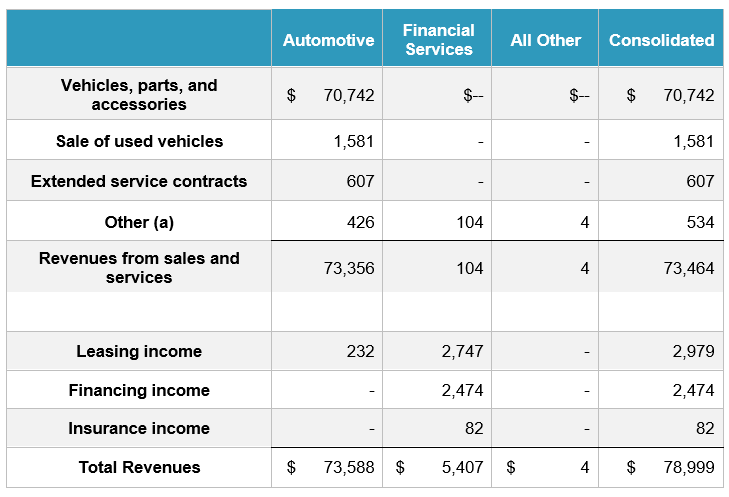 As seen in the tables below, about 96% of Ford’s revenues from contracts with customers come from its sale of vehicles, parts, and accessories. Although the SEC did not object to Ford’s response, given that vehicles, parts, and accessories make up well over the majority of its revenues, analysts would almost certainly prefer that Ford further disaggregate this category. For example, in its quarter two earnings call on July 26, 2017, analysts asked for further disaggregation of product lines, specifically requesting revenue details for SUVs, crossovers, and pickups. Analysts are also likely to be interested in further details regarding luxury and non-luxury automobiles, and the sales mix of vehicles, parts, and accessories. 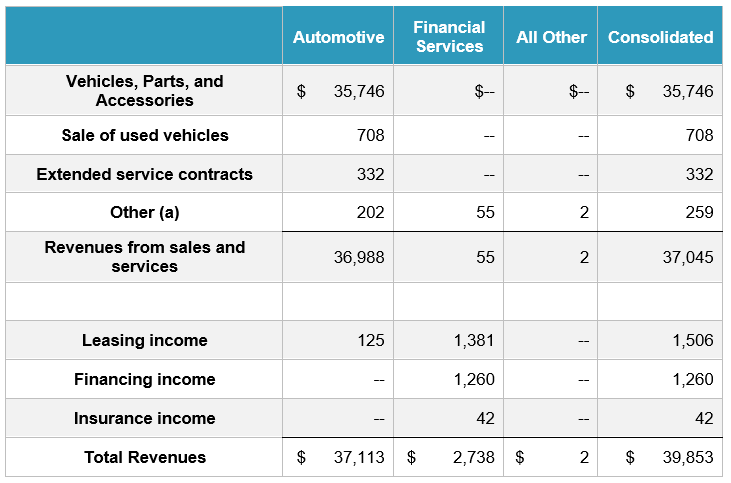 For example, do vehicles make up the majority of revenues, or do parts and accessories? How have these revenues changed relative to each other over time? As much as analysts and investors may want to see more detailed disaggregation in Ford’s revenue disclosures, there are a number of reasons why Ford may not provide such details. First, Ford may not provide more detailed disaggregation because doing so would reveal information Ford considers proprietary, resulting in a competitive disadvantage. In addition, Ford’s existing accounting system may not be set up to gather and organize financial information in the way analysts and investors want to see it. For example, although analysts may want to see retail sales numbers for each vehicle category Ford sells, according to its earnings call Ford doesn’t actually track retail sales dollars and instead relies on industry reports themselves for these numbers. Finally, while Ford may have a data warehouse with all kinds of customer and revenue data useful for disaggregation, it may not be considered an “accounting system” in the scope of SOX, and therefore is not sufficiently reliable for external disclosure. The tables below depict Ford’s disaggregation of revenue for both the second quarter and then the first half of the year 2017. They show the different categories for revenue from contracts with customers in addition to other sources of revenue1. Sale of used vehicles is not included with Ford’s first category of vehicles, parts, and accessories because of the difference in product, customer class, timing of revenue recognition and variable consideration. Products in this category also differ from new vehicles in age, brand, and type of warranties. Rather than recognizing revenue at shipment, Ford recognizes revenue when vehicles are sold. Prices are not fixed and can be sold “either at auction or at retail sale.” Finally, the consideration for used vehicles does not vary with refunds, rebates, and returns as it does with new vehicles, parts, and accessories. Another source of revenue for Ford is the sale of extended service contracts. Extended service contracts last up to eight years, and include repairs, maintenance, and other benefits available to Ford car owners. These contracts are treated separately from other services and products because payment is received at the inception of the contract and revenue is recognized over the life of the contract. In its comment letter Ford stated, “the contract price is fixed and does not contain variable consideration. Contracts contain performance obligations, and these are satisfied over time as repairs are made.” Various contract options are available; however, Ford does not go into detail about the different types of contracts. Ford’s final category for disaggregation of revenue from contracts with customers is “Other revenue.” This consists mainly of revenue from the sale of third-party services or products to Ford’s customers/dealers, and revenue from “vehicle-related design and testing services.” Ford recognizes this revenue when the service is completed and the company is entitled to payment. Even after further explanation, the SEC issued yet another comment letter in December 2017 asking Ford to explain how certain public information (e.g., monthly sales reports, strategic updates, earnings calls) influenced its choice of categories for disaggregation of revenue. More simply put, the SEC wanted to know what information Ford disclosed in other public statements and how that information compares with its disclosures of disaggregation of revenue in the 10-Q. If Ford is disclosing information in a specific way in one document, it should be disclosing that information in a similar way elsewhere. The update emphasized our goal to develop a diverse portfolio of revenue streams in the future, instead of relying so heavily on today’s predominant source of revenue and profit – new vehicles, parts, and accessories. A diverse portfolio of future products and services will allow us to re-base revenue, attack costs, and grow profitably. In a recent study, Deloitte indicated that, “most adopters (approximately 90 percent) appeared to use two or fewer categories…” (Deloitte Heads Up) The most common categories are product/service type (55%), geography (34%), contract type (9%), and customer type (9%). Ford used four categories: vehicles, parts and accessories, used vehicles, service contracts, and other revenue. Other categories were considered, but not used. 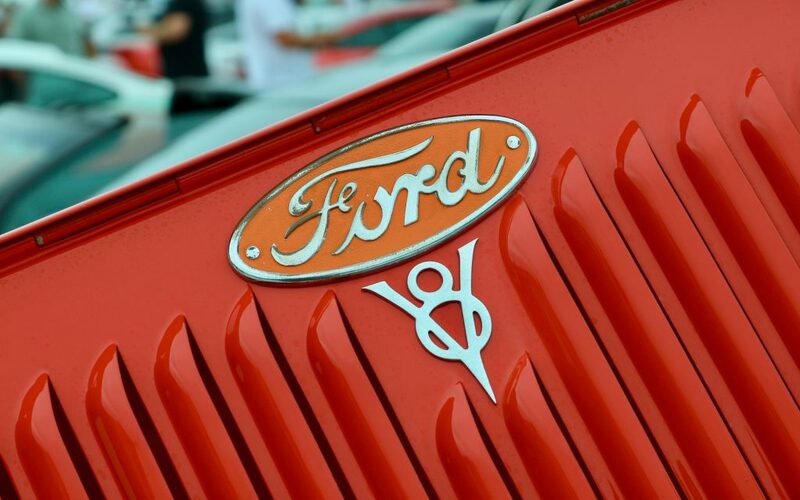 Consistent with the practice of most companies adopting ASC 606, Ford created a new revenue footnote to disclose its disaggregation of revenue. After reading this article, we hope you have a better idea of how to choose categories for your company’s disclosure of disaggregation of revenue that will be useful to investors and other users of your financial statements. For another example of a disclosure of disaggregation of revenue, check out our Alphabet Inc. case study.